Hotel Sandesh The Prince Mysore, Sandesh The Prince Hotel Mysore, Reservation for Hotel Sandesh The Prince, Mysore, India. 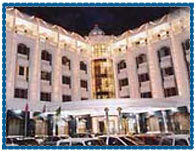 Address: Hotel Sandesh The Prince, Mysore, Karnataka, India. 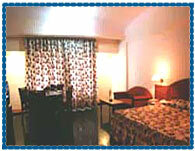 Hotel Sandesh The Prince is situated in heart of historic city of Mysore. It is a world class hotel with its distinctive location, design and Interior offering the luxurious and modern amenities to its guests. 24 Hours Room Service, Currency Exchange, All Major Credit Cards Accepted, Cyber Cafe, Guide on Request, Secretarial Service, Valet Service, Photo Copying, Shopping Arcade, Personal Amenities Shop, Beauty Parlour for Ladies & Gents Exclusive, Travel Desk, Safe Deposit Lockers, Doctor On Call, Ample Parking Space for Vehicles, Laundry Services, Swimming pool, Exclusive Childrens Playing Area, Multi Gym, Games Room for Children, Steam, Snooker.